Yesterday around 4:30pm I looked out back and saw 4 high school age kids, girls and boys, in Tuxedo’s and Dresses standing in the middle of my lawn with cameras. I thought it odd and then even odder when I realized they were all pointing their cameras in a single direction. I couldn’t see what they were looking at so I went to the side door only to see a MOOSE eating on my neighbor’s tree! A Moose? Seriously? I’ve never seen a moose in this neck of the woods. For one thing, it’s not a “neck of the woods”.. it’s farm country! I too grabbed my camera and tried to take some pictures in what was very poor light. As I went outside there was a small contingency of neighbors and even a weekly newspaper reporter driving up. Word was out! 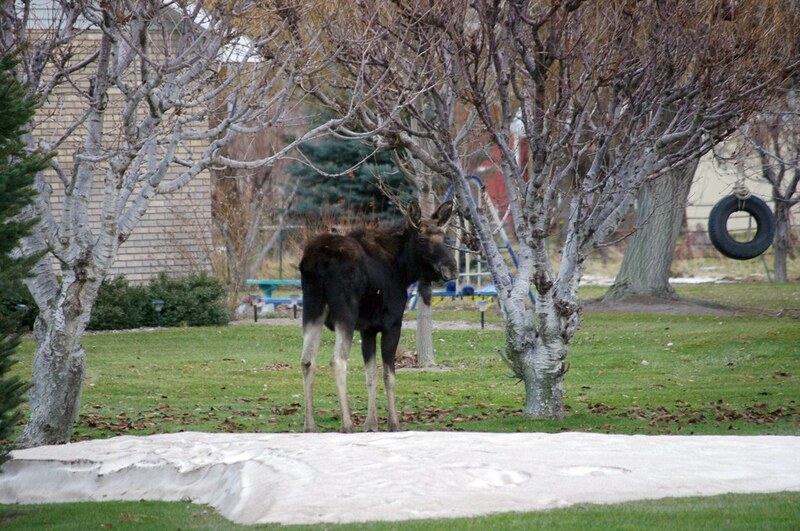 Apparently this moose was here all day long, spending much of the time in my very own back yard! Now I understand why that fool dog across the street was barking incessantly all day! It’s sort of amazing to think that I can be sitting here in my home office while a Moose walks through my back yard. Neighbors speculate that he just came up from the river, which is about a 1/2 mile away. Fish and Game told a neighbor that they would be back the next day to relocate it if it hadn’t left by then. The speculation is that this is a yearling. It’s hard to see, but it does have small antlers just a little longer than it”s ears. It was not easily spooked and just walked around, taking care of business, eating snow and buds off tree limbs. Mailing Addresses, what a pain! Linda appears in my kitchen to bring balance back to the universe. A universe that now has decorated Xmas trees! Posted with WordPress for BlackBerry.